Membrane–bound and secreted neuregulin isoforms induce growth, survival and differentiation by activating erbB tyrosine kinase receptors. In cultured cardiomyocytes, erbB2 and erbB4 receptors regulate apoptosis by controlling bcl–x splicing, and conditional elimination of erbB2 induces dilative cardiomyopathy in vivo. 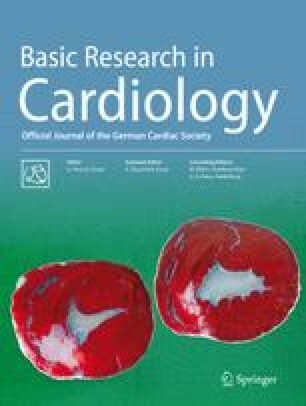 Therefore, we analyzed expression and activation of erbB receptors in left ventricular myocardium from 32 heart failure patients, from 10 organ donors, and from 15 heart failure patients prior to and following unloading by ventricular assist devices. ErbB receptors, expressed in cardiomyocytes and noncardiomyocytes, are downregulated in failing myocardium as mRNA (which is renormalized by hemodynamic unloading) and as protein (erbB2: –25%; erbB4: –70%), their phosphorylation is reduced and bcl–x splicing is shifted towards 6.7–fold augmentation of proapoptotic Bcl–xS, compatible with attenuated erbB signaling. However, secreted and membrane–anchored neuregulin–1 isoforms, preferentially expressed in microvascular endothelium, are induced and not lowered with heart failure, while expression of erbB–inhibitory neuregulin isoforms or of autoinhibitory soluble erbB isoforms could not be demonstrated as potential causes of erbB receptor inhibition. We conclude that erbB receptor inactivation by unknown mechanisms results in altered splicing of bcl–x towards enhanced formation of proapoptotic Bcl–xS, thereby contributing to enhanced apoptotic susceptibility of failing human myocardium.